Thank you for taking the time to check out our Vietbet Sportsbook review! Vietbet has been in business since 2002, and in 2009 they joined the 5Dimes umbrella of sportsbooks. As an aside, you can find our review for 5Dimes here. We speak very highly of 5Dimes in our other reviews so to be under that umbrella is a very positive sign for this book. Vietbet caters to the Asian/Vietnamese markets. They have a lot of clerks on standby ready to assist with questions about depositing, withdrawals, and placing bets. All of the clerks are fluent in five languages which include English, Spanish, Vietnamese, Mandarin, and Taiwanese and are available by Phone, Email, and Live Chat. Depending on your jurisdiction, we like to reference Is Online Sports Betting Legal? as we are not lawyers and don’t delve into the legality of betting on this site. There are a variety of good ways to fund your Vietbet account. What is quickly becoming the most popular method and the easiest way to fund your account is through Bitcoin. Deposits are accepted with a minimum of $100 and a maximum of up to $25,000. If Bitcoin isn’t your thing then the other traditional methods of paying which include a credit card. Overall, all the methods of getting money into your account are extremely easy and we give Vietbet top marks here. The betting platform for Vietbet is the same one that is also used for 5Dimes and SportBet. The platform is very simple and functional and I think that it is certainly one of the most straightforward systems that are currently available out there. On the first page (not pictured), the user selects the sports or category type of the bets that they would like to look at. They are then brought to a page (pictured above), that lists all of the different bets within that category. From there, the user simply types in the amount that they want to bet and then clicks on the “Continue” button near the top of the page. The user is then brought to a confirmation page where they can either confirm or cancel the bet. Like most systems that are found online, it is practically impossible to make a bet that one didn’t intend to make. As a whole, this isn’t the prettiest system that you may find out there in the online betting world, but it gets the job done. Perhaps the biggest strengths of all the books that fall under the 5Dimes umbrella group are that you are getting the best odds available in almost every sport and prop. Vietbet excels in this area as the lines on all the major sports match ups are up earlier than most and the juice on the game is very low. For those not familiar with sports betting terminology, “juice” is defined as the commission paid to the sportsbook any time you lose your bet. For the experienced sports punter, this type of platform provides a very distinct advantage. With early lines and low juice, the bettor can jump in and make a bet before the line moves in one direction or another later on in the day or week. This is a situation where the gambler really can end up with an edge over the house if they know what they are doing. Anyways, it would be hard not to give Vietbet a perfect score in this category. Certainly, one of the biggest areas that need improvement is in the Vietbet sportsbook mobile platform. There is functionality within the web site that detects whether you are on a mobile or tablet device and it gives you the option if you want to continue in mobile or full site mode. In all honesty, neither are very appealing. The full site mode on a mobile phone is very hard to use because of all the options and small text. 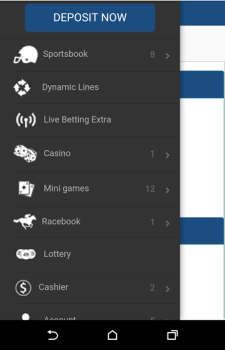 The mobile mode is a bit clunky and there were options in the live betting menu that we couldn’t even get to work. On a positive note, the menus and platform are organized very well with Vietbet’s mobile mode. Making a bet on a mobile device is just as easy as making a bet from your computer so mobile mode really isn’t a total loss. If a strong mobile platform is what you are looking for then we highly suggest BetOnline. If you can get past the relatively weak mobile platform then Vietbet is still a very strong sportsbook candidate as this is surely it’s weakest spot. 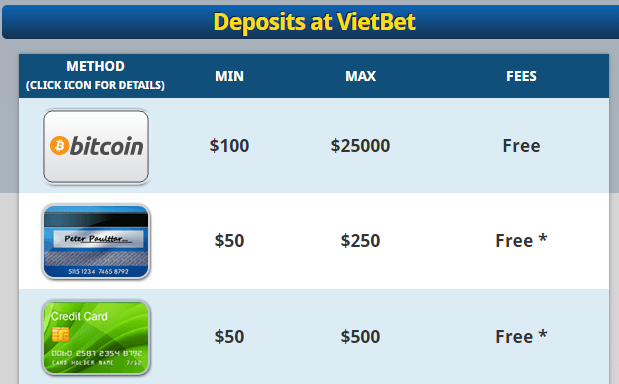 There are a few different ways to get payouts at Vietbet and all of them have proven to be very reliable. Bitcoin is easily the best and most efficient way to get paid out and it always comes with zero associated fee. Other methods, though not recommended, and way less popular are person to person or a Cashier’s check. All of these come with pretty stiff fees unless you meet the requirements for a free payout. Note that if getting paid out by a check that there is always an associated fee. Payouts are very timely and reliable and this is another area that Vietbet gets perfect marks. This area is sort of a tough one to judge because we typically only review the sportsbook portion of the site. As far as special bonuses or promotions go, Vietbet really doesn’t have too much to offer. One needs to remember though, that the trade off here is that you are always getting early lines and low juice (see the Odds/Bet Limits section above). However, if you are looking to delve into the casino game section of the site then Vietbet offers a variety of different promotions and bonuses to play different games. Again, we won’t get into this too much here, but there are promotions available on that end of things. The original posting of this blog was on April 12th, 2016. 6/20/2017: A few minor changes to the deposits and withdrawals. Overall, Vietbet has held steady as a reliable and strong sportsbook to use. Pro: Lots of options and fast payouts! Pro: Customer service fluent in Vietnamese, Mandarin, and Taiwanese. Pro: Early lines with low juice. Pro: Is sister site to 5Dimes which is also highly reputable. Con: Very weak mobile betting interface. Con: If you aren’t of Asian descent, there isn’t much reason to use this over 5Dimes. In all, Vietbet gets very high marks from us as a sportsbook and we highly recommend them. This sportsbook is very legit and has a very long history of positive reviews. Vietbet is especially perfect for players of Vietnamese decent (as if that couldn’t be deduced from the sportsbook name).